So Nick Saint over at the Silicon Alley Insider has a problem. It seems that all of a sudden, The Nickster’s BlackBerry has a “Bing” icon on it. And he didn’t put it there, either. Nick thinks it might it have something to do with the big bucks Microsoft-Verizon deal. You think? 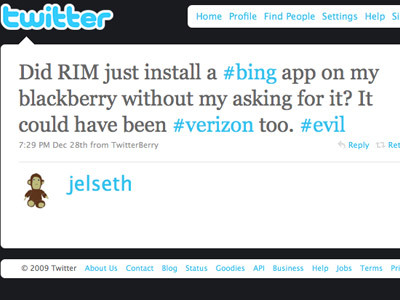 » Bing the default on iPhone?